One aspect of being an SEO Company is managing clients’ Pay Per Click (PPC) campaigns, usually as an adjunct to ongoing organic search engine optimization efforts. Pay Per Click, most commonly Google Adwords, is a time-honored way to bring traffic to your web site for what can often be a very cost-effective level of spending. Companies should tread carefully with PPC, however, because a poorly managed campaign can quickly become very expensive for not much gain. We at Positronic Design, The SEO Company, are certified Google Engage for Agencies Partners and as such can connect any new Google Adwords customer who wants to try Pay Per Click Search Engine Marketing with a FREE $100 in advertising spending money courtesy of Google. Yes, that’s right. If you’ve never had an Adwords account, you qualify to get a FREE $100 in Google Adwords Advertising to try out PPC, and see if it’s right for you and your web site. 1) Choosing the right strategy and products/services to market. 2) Identifying the correct keywords to drive relevant traffic to the site. 3) Designing the proper landing page mechanisms to convert site visitors. If these things can be done with clarity and effectiveness, then PPC advertising is an excellent compliment to organic search engine optimization strategies, which usually are performed concurrently. Call us today if you’d like your FREE $100 worth of Google Spending Money and we can set you up with a coupon code to use at your signup and a free hour of keyword review and overall consulting to help get you started. We feel that it’s the best way to introduce people to our services, and show them the net value that comes out of a properly run PPC campaign. All advertising costs money. Google is the new “Yellow Pages” where everybody looks things up. If you can’t get the keywords you want as organic search listings, then you may well want to skip all that waiting and start coming up on the Google search results pages NOW, and not potentially months from now. 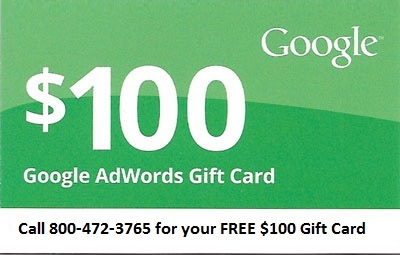 Give us a call at 800.472.3765 if you’d like to get your FREE $100 and start getting visitors to your site right away.